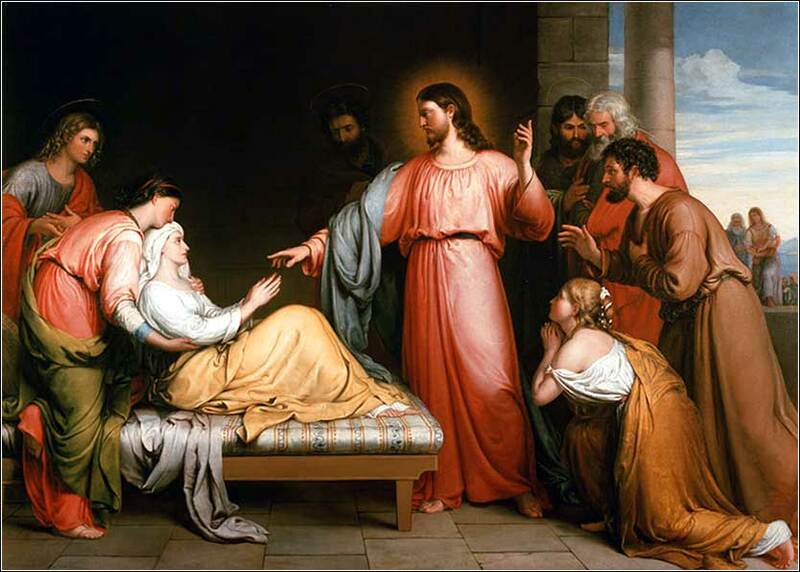 Christ Healing the Mother-in-Law of Simon Peter by John Bridges, ca. 1852. Bridges was a professional portrait painter. His talents as an artist were just beginning to show when he died at age 34. All our prayers are with those who need to hear this today. We should never forget the importance of sharing our faith, our problems, and our doubts with another believer. Well, we left something off, didn't we? “If you have faith.” Faith is the key issue in Christian life, for it is by faith that we are saved. And one might narrow faith down to this question: Do we believe that God brought his only Son, Jesus of Nazareth, back to life after he was crucified? It is an accepted historical fact that Jesus existed and was crucified. Several reliable non-Christian sources record the event and none dispute it. There is no account of what became of the body, however, except in the Bible. But what if there were? It wouldn't matter. If Jesus had been executed last month and there were videos of him walking around three days after he died, it would not make one bit of difference. Those whom God has not chosen for salvation would not have ears to hear it. They would simply say it was faked. We can grow in faith. That is the meaning of the repeated references to a mustard seed. Once the seed is planted, if our mind stays open, God will nourish it and it will grow, every day. Our love of Christ is a living spirit that can grow and prosper in us. But it takes time. There has been a lot of speculation and difference of opinion on exactly what Christ and John meant. But why tamper with our salvation, once we understand the monumental importance of the gift we have received? If we love Christ, we want to get closer to Him. We change our lives to conform to God.